We would like to express our thanks to everyone posted "Up/Down" Flipnotes and hope that you enjoyed the topic. Flipnote Hatena will be closing in 15 days, and there are only 2 weekly topics left (including this week). If you have not yet posted a weekly topic Flipnote please give it a try! ★ Check out the cute baby being thrown up and down in this funny animation by Tako death (id:rabbit_thankyou) from Japan. The best of the last week's topic: "Up/Down"
There were over 580 Flipnotes posted about last week's topic, and here are some of our favorites from around the world. ★ Crossing the street is easy in this up/down Flipnote by Najat.T.S (id:gold69)! ★ We liked this nicely drawn animation of a roller coaster by IvanaJones (id:zuperartist). ★ What goes up must come down in this Flipnote by dana m. (id:DanaM). ★ Be careful where you fly a kite in this animation by Arty Flo (id:runako-rawlins-2001). ★ Take a journey through the earth in this Flipnote by *•Blue•* (id:pinko3857). ★ Two characters discuss which way to go in this funny animation by 99th Dream (id:SwitchbladeJoey). ★ Have some fun on a trampoline in this up/down Flipnote by Automaton (id:doofus). ★ We liked this stylish and colorful up/down animation by Armageddon (id:Catastrofe). ★ A trio of characters play with an elevator in this animation by Darwin (id:chechojandro). ★ We enjoyed the upside down world in this Flipnote by Chopper ～☆ (id:SuperPikachu). ★ Trampolines and reading don't mix in this animation by DSITEROL (id:Classic-Angels). ★ We liked this exciting up/down animation posted by JunJun (id:junkun123). ★ Two worlds above and below meet in this amazing animation by Foomin (id:wrbyno10). ★ Check out the extreme bungee jumping in this animation by Johnny3 (id:a3735963). ★ A character climbs up and takes a dive in this Flipnote by Keiko (id:mangatamago). ★ A rabbit has fun on a seesaw in this cute animation by Touden★Haruka (id:yf9212). ★ Two parts come together to form a robot in this Flipnote by FENNEC (id:CYBASTER). This week we would like you to create Flipnotes about wishes. Makes stories about wishes for the future, wishing wells, magic lamps, or hopes and dreams. See where your creativity takes you! Please submit your weekly topic Flipnotes by 9:00 PM on May 23, 2013 (Thursday) US Pacific Time, and we will present some of our favorites on May 24, 2013 (Friday). 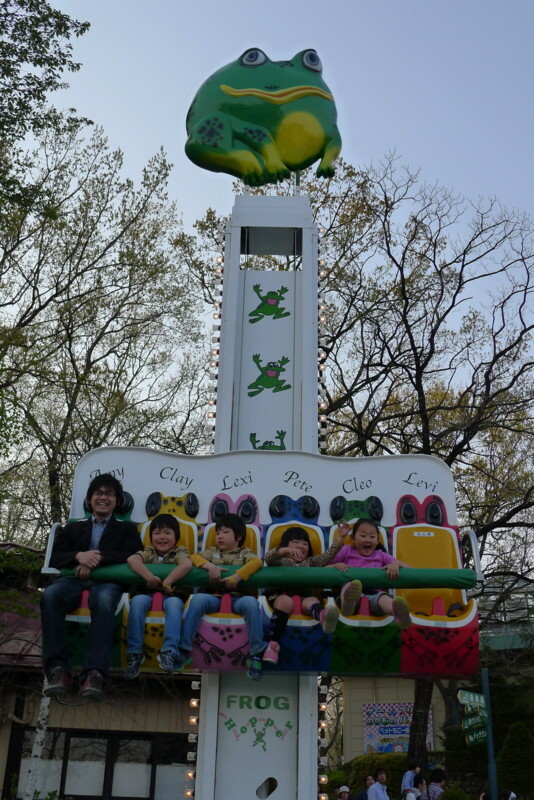 ★ Aaron (id:aaron) took this photo of a jumping frog ride at an amusement park in Tochigi, Japan.